If you want lots of Spanish reward stickers for your money but find our mini stickers just a little too.... well, mini, then these midi stickers are perfect for you! Measuring 19mm in diameter, they're smaller than our standard 28mm reward stickers, but are still big enough to proudly display on clothing. This pack consists of a variety of Spanish merit stickers for praise and encouragement. 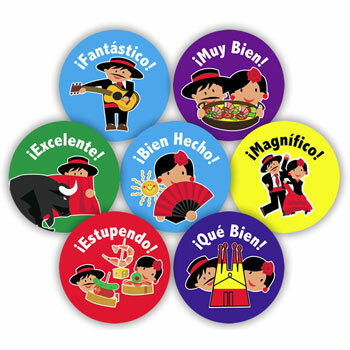 Each sticker features a colourful Hispanic character design with a different praise message in Spanish. This is a mixed pack of 245 reward stickers. There are 5 sheets supplied, each containing 49 stickers of 7 different designs. Lovely stickers but would not buy again as had not realised about the bull one and ended up not using it. Don't agree with bullfighting and neither did my students!